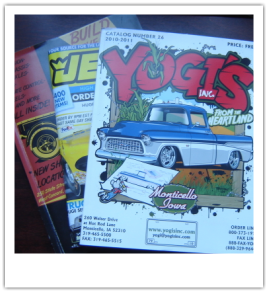 Another great resource for street rod enthusiasts are the many company catalogs available. Companies such as those listed below provide a yearly catalog of parts used on street rods. These catalogs contain just about every part that can be used on a variety of street rods. Some of the catalog companies specialize in certain areas, while others cover most areas for street rods. These companies are selling the parts and components for a variety of companies that manufacture the products and components. The following are a selected list of catalog companies.